A quick, anonymous and FREE way for schools to source the best products and services. 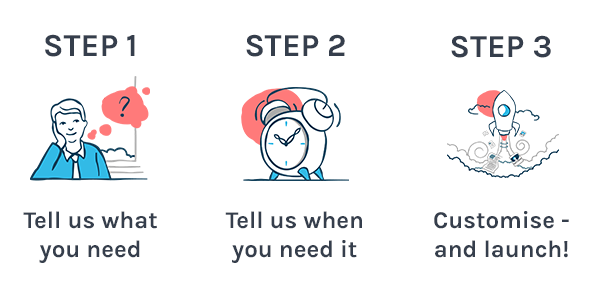 Use our three simple steps to get personalised quotes, compare suppliers and prove you found the best value for money! Starting your procurement project couldn’t be easier. Pick what you need from our school-focused categories, and give us an idea of your school's budget if you like. This whole process is anonymous; suppliers won't see who you or your school are, so no pressure or pesky sales calls! Urgent job? Or getting quotes for later? We notify suppliers of your deadlines for quotes and delivery so you can get what you need, when you need it. And we take the headache out of being compliant, since our one simple process follows government advice on buying for schools! Be as quick or detailed as you'd like. Upload any specification documents or files you think might be useful, and ask questions to be answered alongside your quotes. You can suggest suppliers you'd like to hear from, and pick criteria to later judge quotes against. Whatever you choose, you’ll know you’re getting quotes tailor-made for your school and your budget. It’s time to launch your procurement project to the marketplace! One click from you and education.co.uk will do the work, sending out your requirements so you can sit back and wait for the quotes to come in. We'll connect you with education-focused suppliers who have experience of working with schools - you can see their case studies on their education.co.uk profiles. There’s no easier way to compare a range of quotes for your school! Our school-focused service doesn't stop when you receive your quotes. Message suppliers anonymously and evaluate your quotes online with our easy-to-use process. Enjoy peace of mind; we've built education.co.uk to make you effortlessly compliant, and you can make notes with us as you go. And don't panic about paperwork - we'll safely store it all together in your online archive! Get your fantastic new products and services! You've compared your quotes, you've chosen your winning supplier - now it's time to reap the rewards! As your delivery arrives, you'll be confident you've got the best value for money and all the notes you need to prove it. With your records safely stored online, and your budget looking healthier than ever, you can focus on your school's great new products and services... and starting your next education.co.uk project!